Royal Albert Flower of the Month teacup trio? It's another name for Aster. The birthstone for the month of September is the Sapphire. Our sweet special friend LaRue celebrates her birthday in September. 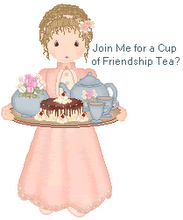 In addition, several tea friends celebrate September birthdays.